Having grown up on a farm and with grandparents who were involved in community forestry projects, Motsa’s passion for trees started at a young age. In rural Swaziland, Motsa’s grandparents grew trees for their own personal use, for fuel and for making furniture. “I grew up in an environment where forests are an immensely important resource, where we use wood to make charcoal for cooking,” says Motsa. But as he grew up, Motsa noticed a depletion of the forest resources. A growing population and rising fuel prices were driving more people to use wood from the forests. “Areas that had been forested when I was a child became completely bare,” he explains. Motsa, a self-described “farm boy,” knew it was a problem to consume more than was produced and he grew interested in learning more about sustainable forest management. After high school, he moved to CapeTown in South Africa to attend the Nelson Mandela Metropolitan University and become a forester. While he was studying in Cape Town, one of Motsa’s professors came to UBC as a visiting scholar. 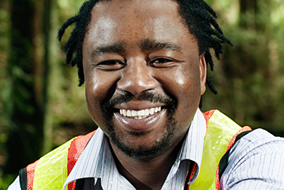 When he returned to the school and recognized Motsa’s passion for learning about forest sustainability, he encouraged Motsa to pursue studies at UBC. The 29-year-old ended up in the forest engineering program. Now that he is finished his studies, Motsa is hoping to secure a job that will take him back to southern Africa. He’s interviewing with global environmental organizations and will work as a manager of forest and logging operations. Motsa hopes to prevent further depletion of forest resources by providing communities with information about conservation. As excited as he is to start work, Motsa will miss Vancouver and UBC. He’s made great friends and joined a number of clubs and organizations. He is part of the Forestry Undergraduate Society, the Logger Sports Team, the African Awareness Society, he plays soccer and he volunteers with Go Global. Motsa has really enjoyed volunteering with Go Global; he gives awareness classes to UBC students who are going to Africa through programs offered by Go Global. Motsa says it is rewarding when he meets up with students after they’ve returned from Africa and he can see that their perceptions have been changed. When he gets back home, Motsa is excited to start looking for ways to bring what he has learned at UBC to the forests of Swaziland and southern Africa. He plans to work with communities and decide how best to grow and use the forests. Whether it is by planting faster-growing tree species or replacing wood with another fuel, Motsa says he will work to find solutions because he lives for the idea of sustainable forest management.